I’ve recently gone on a gluten-free diet. The first time we went out to a real restaurant was interesting. We decided to go there because of the gluten-free options they showed on their website. The website didn’t mention how new this was for them. When I ordered my hamburger on a gluten-free bun the server’s eyes lit up. “Oh! We have a new gluten-free bun for that!” Somehow she was telling me about something existing after I had already ordered it. Then a few minutes later she came back to inform me that I couldn’t have fries with my burger because they aren’t cooked in a separate fryer and would be contaminated. I opted for a baked potato upgrade. When our order arrived it was brought to us by the manager of the restaurant. He was very excited to serve me my hamburger and GIANT baked potato. He chatted us up about the local bakery they found to make the hamburger buns and how expensive they are but it’s worth it so that families can all dine together. It was all very charming how excited they were to see me eat that burger. Today’s Maximumble lends a helping hand. I’m pretty much bullet-proof when it comes to allergies and sensitivities – I’ve eaten whatever was put in front of me, wherever I’ve been – and I’ve been to the far side of the globe and back again. Some of it, I didn’t *like,* but none of it caused me anything other than aesthetic distress. My sister, though… She’s a wreck. And her kids are much worse than wrecks – It’s easier to list what they *can* eat, than what they can’t. Reminds me of a date I went on, except she actually knew what had what in it. Being gluten free myself, I can’t help but wonder…Do you actually have a gluten allergy/sensitivity, or are you just trying it as a health or weight loss diet? Or an elimination diet… I would imagine you have a sensitivity given that you passed up the cross contaminated food. Celiac? If you are allergic, my condolences! But I find gluten-free cakes are nicer than normal ones. They have less of a tendency to dry out horribly, and they stay delicious and moist for DAYS. Even in a fridge. My major food allergy is whole tomatoes. I get a horrible case of itchy hives (and sometimes an accompanying asthma attack) if I eat them. Whatever is in them is apparently destroyed in processing because I have no problem eating tomato-based sauces. Was it a good burger? Some of the places around us are gluten free now, and the food really didn’t change. The bread did. Naught to add to the discussion, just think that the tale about the restaurant is absolutely adorable. Gluten is a naturally occurring protein in wheat, and only affects people with Celiac Disease, which less than 1% of the population has. Studies show that a little less than 1% have Coeliac disease, but around 15% (1 in 7 people) are Gluten Intollerant or Sensitive to a noticable degree. 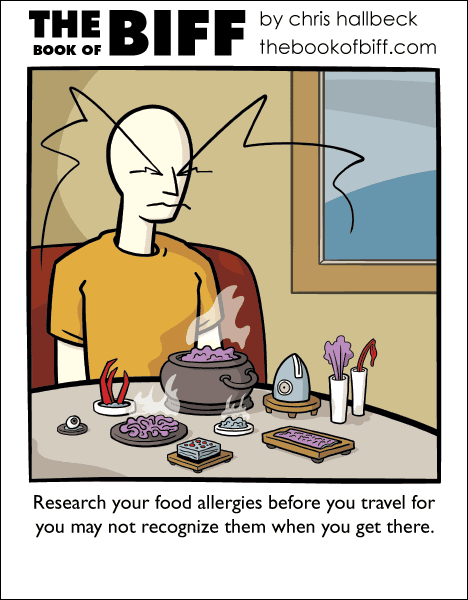 @NonHuman – allergy related – The Webber Grill. @mjolner – it was delicious! Looks *really* good. Have to try them next time I take my wife and kids to see her family. PLUS… They give recipes – Nice touch! If its not on fire, I can eat it. My aunt has coeliac. She’s actually quite ill with it, and she had to drop out of university 2 years ago because she just couldn’t function. She’s getting better now, though. She’s also allergic to capsicum peppers. @Peter Punjab That stat might be true where you live but you should try living in Ireland! We seem to have an awful lot of coeliacs (like me) and so many more who are coeliac and don’t even know it. I lost the ability to process milk protein a while back. The slightest bit of milk, butter, or cheese lays me out for a day. Going out to a restaurant is always a bit of a gamble. Sometimes it is terrible – I actually cannot eat anything on the menu of Olive Garden. Sometimes, though, it is an amazing experience. Some of the fancier restaurants I have been to have actually brought out a separate menu for specific food allergies. That kind of care about your customers is really missing in most places these days. I’m a celiac person too. Recently the Boston Pizzas where I live have had the option to get your pizza with a gluten free crust. It’s pretty delicious. I’ve been a celiac ever since I was born, so I’ve learned to live with it pretty well. Gluten is in wheat, barley, and rye, and many grains (especially oats) are cross contaminated in the milling process. You do not have to be celiac to be gluten intolerant. If you are celiac, gluten is, for lack of a better word, poison. Many people have sensitivities or allergies that are not so extreme that they cannot even tolerate breathing in flour dust. Others have allergies that are just as extreme as celiac disease, but are still just allergies. In other words, gluten is not just in wheat, and celiacs aren’t the only people who can get horribly sick from it. It’s good to know awareness of gluten problems is increasing. My dad is a celiac and it almost killed him; for the longest time no one knew what was wrong with him. Ironically, the doctors would often tell him to eat more fiber and whole grains, the very thing that was poisoning him. Gluten-free is hard! One of my closest friends recently found out that all his ongoing digestive system troubles were because of a wheat allergy. I’ve been re-learning how to cook so that I can make gluten-free foods whenever he visits me (at least once or twice a week). A lot of my early attempts were utter failures, and I still haven’t managed to find a GF pie crust recipe that’s even halfway edible. I can do several types of cookies, cornbread, muffins, biscuits, and a delicious gluten-free carrot cake …. but I haven’t been able to make my friend’s favourite kind of pie (raspberry rhubarb) for him just yet. A few more experiments and I’ll hopefully get it sorted. Anyway, all this discussion on allergies/gluten-free has reminded me of a few months ago, when I believed I was Lactose Intolerant. That sucked. I kept having stomach aches, and I had been eating cheese a lot, and THEN I read about it in a magazine. Have you noticed how if you read about a disease in a magazine, you always think you have it? I am gluten intolerant as well, so I understand your plight! But I find that servers and managers are so willing to help and so excited over helping us out! There’s even a gluten free fish and chips place where I live!!! About the celiac number: that 1 in 133 people stat came out of a 15 yr study that was published in 1948. So those numbers may have been correct for 1934 to 1947. There’s a new study in progress now.